I am fond of exploring and improving the product quality and I have been working as QA Analyst for approx 5+ years. Also have Chrome extension, Web and Mobile(Android & iOS) app testing experience, would be happy to have a new challenges. I need a good quality analyst to prepare documentation! 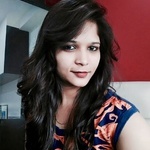 Manju did a great job she is very knowledgeable about QA and is very detailed in her bug reporting. Anytime I asked her to accomplish a task she was able to get the task done with 100% accuracy. Great price and listened to what I need.